Hello, everyone! 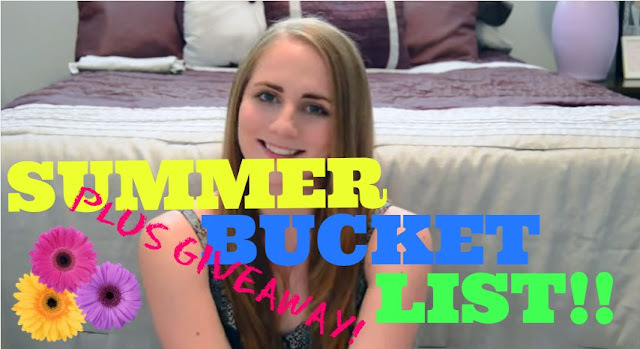 Today I am sharing with you all the video where I talk about my summer bucket list. I actually did a post on this last week, but it was very basic. In the video you will find more of an explanation of each thing as well as some information about how you can win two tickets to see Taylor Swift in concert! Details on the giveaway can be found here. If you enjoyed the video please be sure to give it a thumbs up and subscribe! Summer is just the best time of year to go on adventures. I hope to get to the beach and go to the drive-ins. Love your bucket list! I really need to get back out and play tennis again this summer... although I might wait until fall since it's so hot here haha! And I need to make it to the beach this year for sure!! I totally need to so my summer bucket list. Great list! Who doesn't love summer adventures. Great, fun ideas! Hope you are able to do them ALL! I've been wanting to play tennis too! All about farmer's markets! I love bucket lists! Tennis is so much fun, I love to take advantage of it when we're traveling if they have courts. Getting out on a picnic is on my list too - always so fun! Love tennis! Here in NY it's hard to find places since we need permits to play (& they're pretty pricey), but definitely hope to play some more where I can! I love the idea of a summer bucket list! It makes the summer go by a little bit slower when you have an actual agenda. Great bucket list! And ugh I would love T Swift tickets! What a great post sweetie, what an exiting bucket list! Great idea - and thanks for sharing (via video) your list! Hope you have a great summer - sounds like a great agenda. I applaud you for doing a bucket list! I never do them because I never check ANYTHING off of them! I took tennis lessons one summer and it was a blast! Great list! Great summer bucket list. Still trying to keep up with my wish list, but it is hard lol. You definitely need to go to a winery sometime, this is one of my favorite dates with my husband. We are planning on going to a concert/food truck outing tomorrow... it'll be fun, because I won't have to pack a picnic basket and we'll get to try out some different food trucks. However, I want to do a picnic again this summer. Great video! I love this video! You are so cute! What a fun bucket list! So many of my favorites are on your list!! I love farmer's markets too. There is a huge one nearby that we don't attend enough. I love wine but have never been to a winery either - definitely on my list! Cheer's to Summer! this is so fun! i'm working on the closet one right now! I want to make a summer bucket list- how fun! A bucket list is a great idea. I'd love to do more picnics and hiking. What a cool idea! Super cute. I had no clue you were a Youtuber as well. I watch youtube vids everyday so Im sure going to subscribe :) PS I think Im going to be you #2000 subscriber.